I like to keep on-trend with make-up and beauty tricks for each season. Rounding up the main make-up features which have graced our catwalks for fall was difficult but here are some for your pleasure! Let’s get on board the-never-ending-ever-classic-Cara-Delevingne-full-brow-look train! Which, from a true fan, she has single handily perfected this look and it’s created a global trend! Now let’s stay with this look and add in some berry lip and cheek stain. This is my ideal of fall simple make-up. Just enough color in your cheeks to show off your snow blushed skin! Thankfully my fail safe ‘may-use-more-than-I-should make-up is now very much on trend! 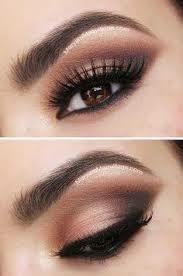 Smokey brown eyes, au natural are back! You can’t go wrong pairing this make-up up with that sparkling frock for Christmas night out or a cozy white jumper! Add some shimmer gold shadow to this look for evening wear. Never did I think glittery lips would be something I would be trying! However, it’s all about the sparkle and I guess it is that time of year where we are fast approaching the festive season. 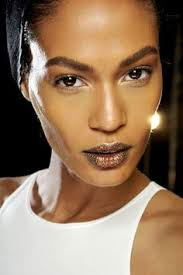 If you aren’t confident enough to go for this full look as seen on the run ways, I sometimes will put some shimmer stick on my lips when I’m looking for that soft, lightly colored slight glitter shimmer. 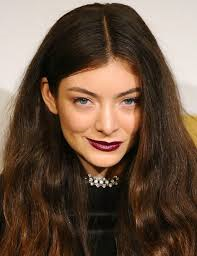 Lorde has shown us over the past couple of months that dark berry lip stick or stain isn’t just for the Emo’s or Goths! For this I’m forever grateful because this color is gorgeous on tanned skin, light skin, dark skin it’s very complimentary. I love this color, especially paired up with white dress or blazer. The contrast in colors works amazingly.